With simple touch control, 3 adjustable brightness levels, WANJIAONE led desk lamp provide the perfect lighting. WANJIAONE led study lamp, new definition of a led desk lamp. Flicker-free and glare-free light source, beneficial to eyes, less fatigue. it's the best choice when you need to choose a reading lamp for your child. WANJIAONE'S Multi-function led desk reading light provides 3-levels of illumination (controlled by Touch button). Comparing to the ordinary Incandescent, Wanjiaone's led desk lamp consume 75% less energy while providing the same brightness and characteristics. Colorful light: Touch the spectrum ring to adjust 256 color changing base, create any variety of atmosphere at the night. If hold down the spectrum ring for 2 seconds, the color would cycle automatically, now you can color your night and life with this magic lamp. 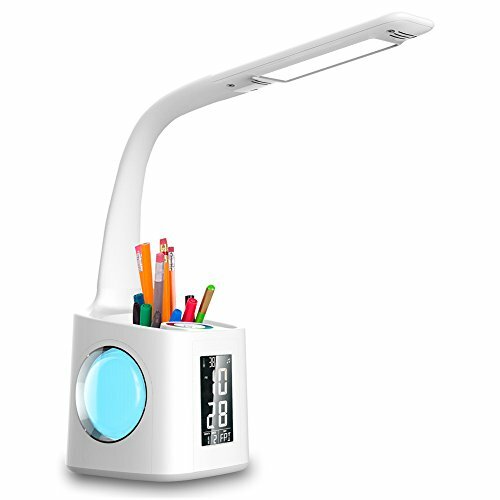 Best gift for children: Large capacity pencil holder can also help you to place something, dimmable reading lamp with 3-Levels of brightness, suitable for students to use as a led desk reading light. Gooseneck desgin: Free to adjust light angle, light up every corner of your world. If you have any questions about this product by wanjiaone, contact us by completing and submitting the form below. If you are looking for a specif part number, please include it with your message.